This game is also know as "Samurai Swords" or "Shogun"
Now this is a strategy board game and has everything you need to quench your thirst for slaughter: armies, castles, diplomacy, politics, and sneak attacks. The most important element to the game is getting your generals experience. This allows for greater movement and thus flexibility. This means you need to attack at least once every turn. In the beginning, you need to “feed” on smaller territories, so don’t gobble them all up the first turn. In the beginning, do not spread out too fast. Slow growth is need in the game of Ikusa. Like most battle games, keep a mix of high quality units and fodder (spearmen). 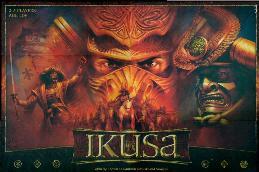 You will find that that the hardest part in Ikusa is not getting units onto the board, but getting them into the armies. You are only allowed 1 new unit in each territory. This means you need to move the army to “swallow” up the new units. Keep in mind that you want to use the cheaper spearmen to be left behind to “claim” your land. So you will need to buy at least three a turn if you are planning to grow. Since you have a limited number of Samurai that can be placed in an army, I put Bowmen in my armies and swordsmen in the provinces. Don’t go too crazy buying Bowmen. They are expensive and you need more rank and file troops to guard them. Keep your armies fat and your provinces lean. Nothing is a bigger target then a 6 unit army. If you army was weaken from a big battle, retreat back into your territory to fatten up. Fat armies can win the game since they can project more power over greater distances. Even if your army is at its maximum size, keep them protected. Two medium sized armies can bring down a large one. Hide them in castles and come out for raids and battles and then move them back behind your lines or in the castles. You have three armies so you should be able to cover your fronts. However, if you find that you need them on one side of your territory, anchor the opposite side with fortresses and castles. They are not perfect and can be taken, but at least it delays the “rear” attack while you deal with the current crises and get over there. Other then for that reason, or to use as a base, do not go castle crazy. Castles can not grow your territory, armies can. The Ninja. I am almost tempted to recommend that (for your first game) you don’t use him. If you bid for it, but lose, then you lose all those men that you could have brought with the coin. However, that being said, The Ninja is a great way, if you can get it cheap, to pin down an army so it doesn’t move so you can attack it, or prevent it from attacking you. So there you go. Keep in mind there is risk to going for Ikusa’s ninja. I personally think the cost is too high in risk. Samurai Swords is a political game, don’t kid yourself. You need to be active and talk with your neighbors. Get a sense of their plans and try to team up with them. Remember, in 2 vs. 1. The two wins. Two armies against one, two players against one, regardless the size of the one. Make others think you’re a victim and never an aggressor. Don’t look too weak or too strong, or at least hide it. Finally, my main strategy: Get to a decent size (15 to 18 territories) and hold. Grow your armies and generals experience. Take and let other takes a few provinces and then wait. Wait for the right moment to swoop in after two big armies collide. One of them will be dead and the other really wounded. This is your end game strategy, wait until one or two opponents are down to one army. Swoop in and get their cards. Then race for the final 35th card. Pick your timing carefully.